At a recent NESA council of overseas schools conference, Dr. Bena Kalick presented on the Habits of Mind and why they make a difference in schools. The 16 Habits of Mind are especially interesting to me in that they relate to how students react when a answer, solution, or information is not immediately known. As a counselor, I believe we should develop students who possess the habits of mind that causes them to actively seek out solutions and information on their own accord. We should ask ourselves, do students demonstrate habits that indicate resilience and grit and a willingness to dig deep when needed? If our students do not exemplify this on a regular basis, educators should question how they can teach habits of mind so as to develop students who behave resourcefully when solutions are not immediately known? As I geeked out over the habits of mind and began planning implementation for my own school community, I suddenly stopped. I realized that in an IB school where PYP concepts, skills, attitudes, and themes are already being addressed, some teachers are not going to be excited about introducing yet another set of terms, words, or ideas. So, how could I impart on staff that Habits of Mind are an important skill set to recognize and explicitly teach students without being another check mark on a “to cover” list? Align the 16 Habits of Mind (new instruction) with the IB Learner Profile (already in place). Habits of Mind are all “-ing” verbs meaning they show action. Therefore, for example, when a child is “managing his/her impulsivity” (Habit of Mind) this is evidence that that child is progressing in being “principled” (IB Learner Profile). Or if a child is “questioning and problem solving” or “creating, imagining, and innovating” (Habits of Mind) these are indicators that this student is on the path of being an “inquirer” (IB Learner Profile). 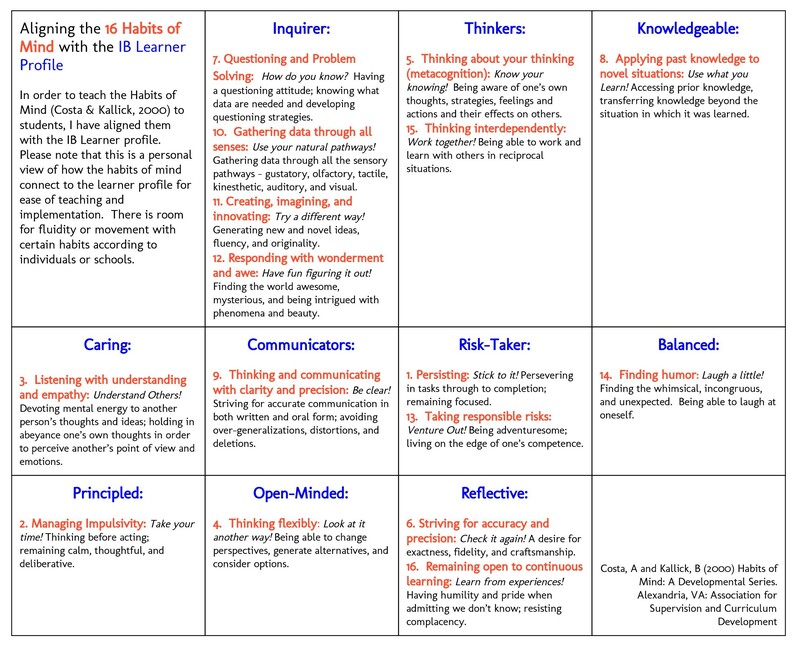 In my opinion, the 16 Habits of Mind are tangible, action-based skills that students can practice on their progression of developing learner profile traits. Habits of Mind provides a concrete understanding and exemplar for students to know what actions would equate development in a specific learner profile trait. It is not another thing for teachers to check off but something that can be promoted in class or recognized when students are exemplifying a Habit of Mind action. By no means are the Habits of Mind the only way to reiterate or promote the learner profile. However, they seem to naturally align and compliment one another in developing students who demonstrate resilience, grit, and the willingness to dig deep when it is required of them. Costa, A. & Kallick, B. (2000). Habits of Mind: A developmental series. Alexandria, VA: Association for Supervision and Curriculum Development.